My friend Karen, was demanding a recount since I only did 30 days of shoes instead of 31 for this month! Since I enjoyed her daily comments I have to post one more pair for today. I stumbled across these at Marshalls awhile ago. 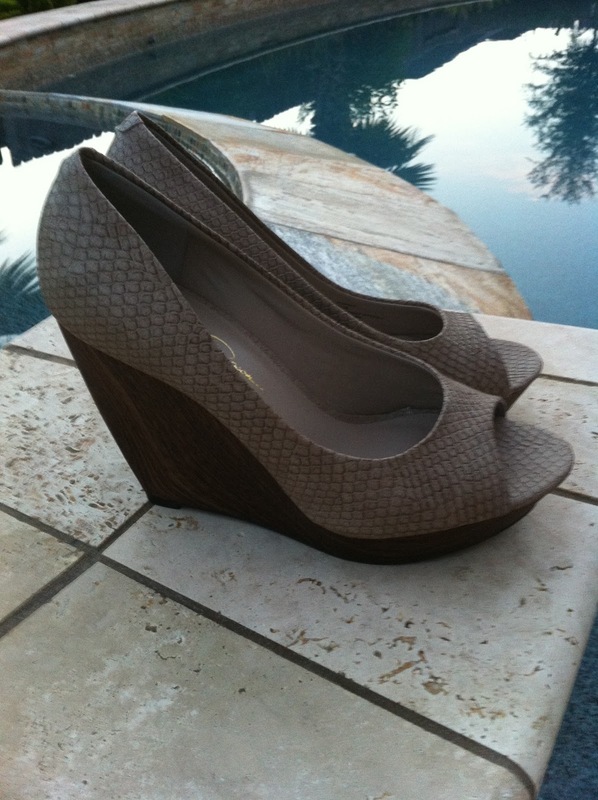 Funny thing is that my super fun friend Kelly in Arizona wore these back in March when we were there for spring break. I loved them then and I love them now! These were so meant to be... right? They are Jessica Simpson and the style is JP-KAPRIX if you want to try to hunt them down. Looking forward to enjoying our three day weekend although I wish I could be back in Illinois celebrating my dad's 60th birthday with him and the family. Hope you have a great weekend too Karen!!! These wedge heels are adorable! I love a good heel that you can wear during the day without looking like Trixie Delight. I love Jessica Simpson shoes. I think she had them designed with performing in mind. They are the one shoe I can wear on stage for three hours and not get sore feet. These are ADORABLE. DANG GIRL, You've got good foot wear. Good to know that you love Jessica Simpson shoes...I'll keep my eye out for you!